Most everyone who follows North Carolina politics got a bit of a shock Tuesday evening when the State Board of Elections refused to certify the 9th Congressional District's election results, and by a unanimous vote (4 Democrats, 4 Republicans, and 1 Unaffiliated), moved to open an investigation surrounding the contest that saw Republican Mark Harris win by 905 votes over Democrat Dan McCready. As WFAE reported, the issue may hang on an "unusual" number of absentee ballots coming into Bladen County. With data from the NC State Board of Elections for both absentee ballot data and for election returns in the 9th Congressional District, one can see the patterns in voting, especially in terms of the types of absentee ballots requested and returned and accepted, in comparison to how the final election results were reported. In the 9th, Republican Mark Harris secured 49.5 percent to Democratic candidate Dan McCready's 48.9 percent, with a margin of 905 votes separating the two candidates. 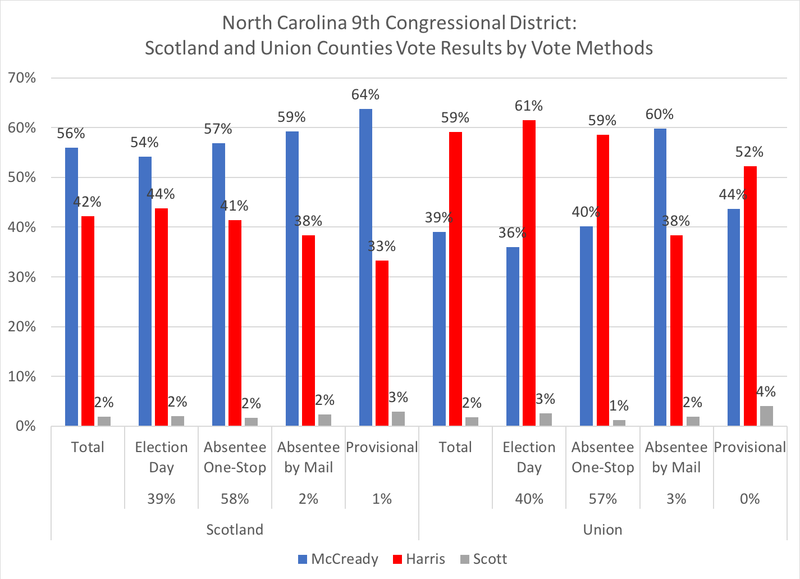 As is the case in almost all of the counties, with the exception of Bladen's provisional ballots, Cumberland's Election Day, and Union's absentee by mail ballots, the county winner generally won amongst the various vote methods in that county. One aspect does stand out when looking at the vote methods in each county and its proportion of the overall ballots cast: Bladen had 7 percent of its ballots cast via absentee by mail method, the largest percentage of the eight counties. Mecklenburg County has the second largest percentage of absentee by mail in its overall ballots cast, at 6 percent. Bladen County saw 22 percent of its requested absentee ballots come from the "by mail" method, which again is the highest of the eight counties. Among returned and accepted ballots, Bladen had the highest percentage, at 13, with Mecklenburg at 10 percent. 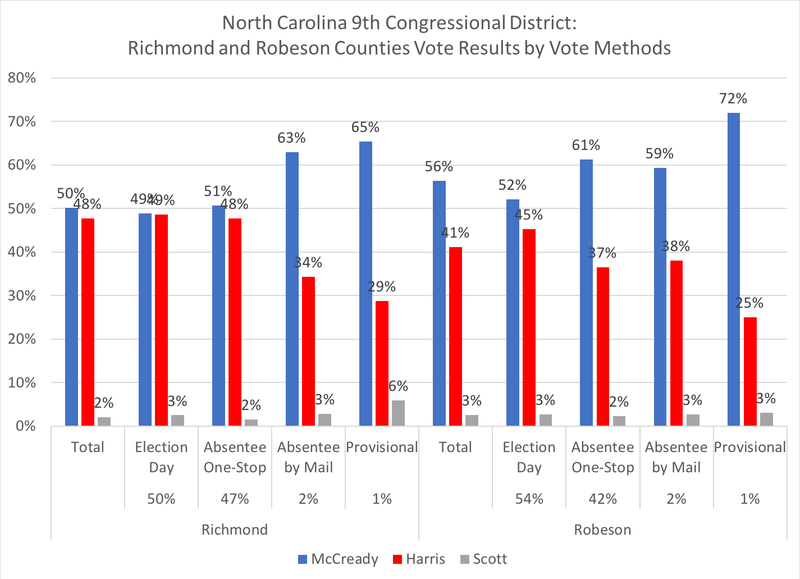 Robeson County had 12 percent of its total absentee ballots requested via the by mail method, with five percent returned and accepted, more in line with the other counties. Robeson County saw nearly two-thirds of its requested absentee by mail ballots not returned, while Bladen had 40 percent of its requested mail ballots not returned. A quarter of the entire district's requested mail absentee ballots were not returned. 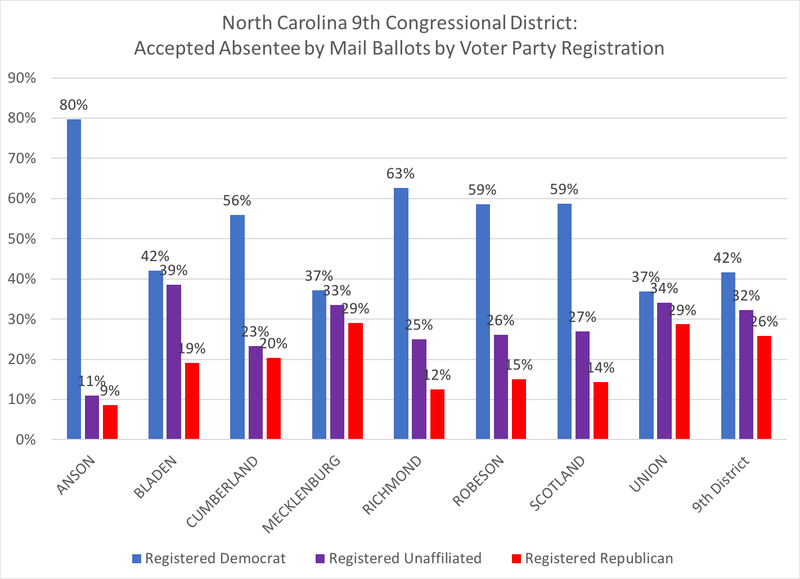 Update: Since posting this article, there's been some news about the NC Democratic Party filing affidavits from voters about absentee ballots that were allegedly picked up and, in some cases, may have been tampered with in terms of votes being cast by someone other than the registered voter (see WFAE's article and two tweets from The Charlotte Observer's Jim Morrill). 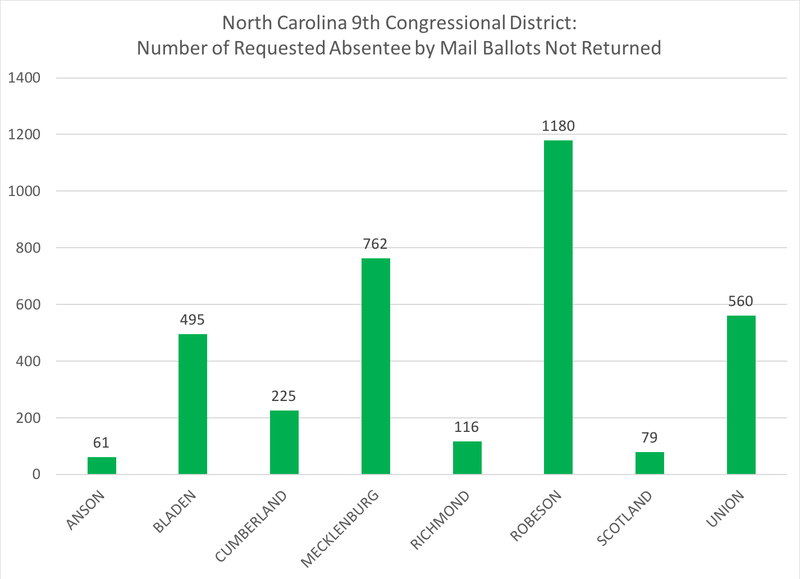 Of the two counties that may be under investigation, Robeson County had 1,180 absentee by mail ballots sent out but not returned, while Bladen County had 495 requested ballots by mail not returned. Out of those two counties, over 1,600 ballots may be questionable regarding their return status, or lack thereof, if the affidavits hold true. 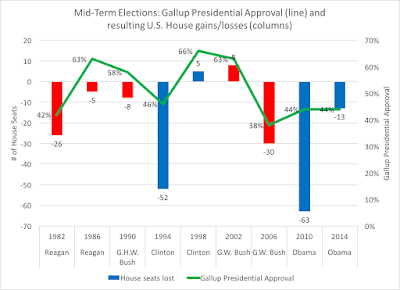 In addition, if ballots were manipulated without the registered voter's knowledge, and votes were changed or spoiled to negate a vote, that would raise serious concerns about the integrity of the 9th Congressional District's election. "Clearly there is something going on in Bladen County," he said. "It's the only county in the state with an organized, street-level vote-by-mail operation. And there is nothing necessarily wrong with that." He said it's not illegal to help people request absentee by mail ballots, but someone can't collect the ballots, a process known as harvesting. 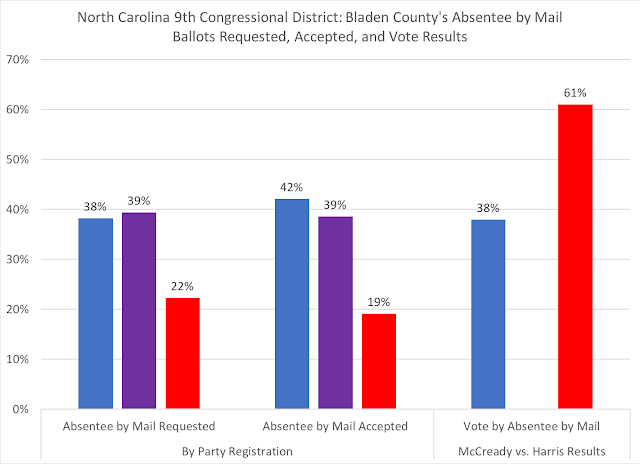 In Bladen County, 60 percent of registered Democrats who requested an absentee by mail ballot returned their ballot and had it accepted, with 54 percent of registered unaffiliated voters returning and having their ballots accepted and 47 percent of registered Republicans doing so. 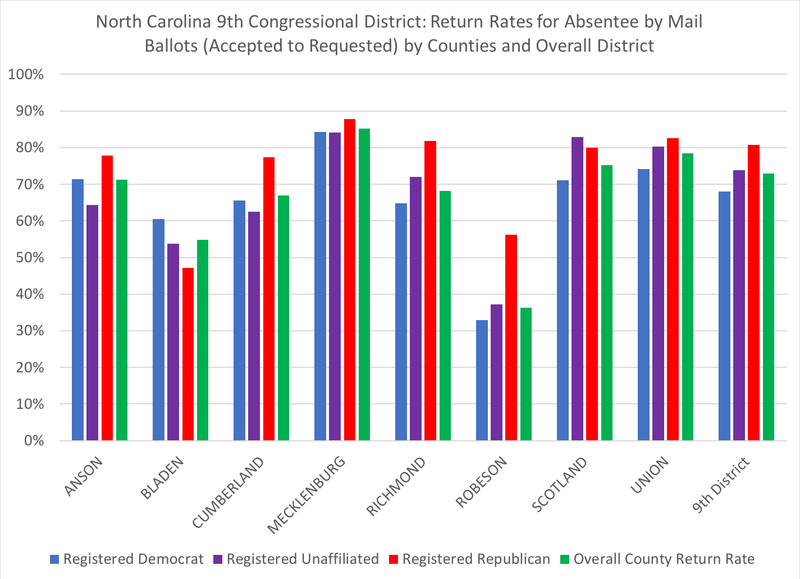 Bladen County is the only county where registered Republicans were the lowest percentage of returned and accepted mail ballots of the eight counties. All of the other counties saw registered Republicans at a higher return rate than registered Democrats, with Scotland having registered unaffiliated voters slightly higher than registered Republicans. Why would this stick out? Well, if one assumes that in North Carolina, there are likely different types of voters, such as: if you are registered Republican, you are likely a firm voter for the GOP, while if you are a rural, older, and white registered Democratic voter, you may be more likely to be a Republican voter. 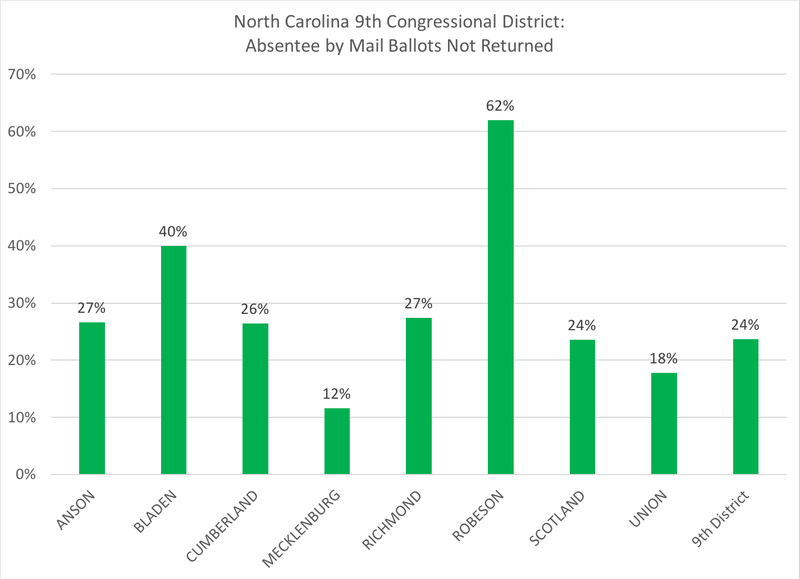 In the entire district, 42 percent of the absentee mail in ballots came from registered Democrats, with 32 percent from registered unaffiliated voters and 26 percent from registered Republicans. 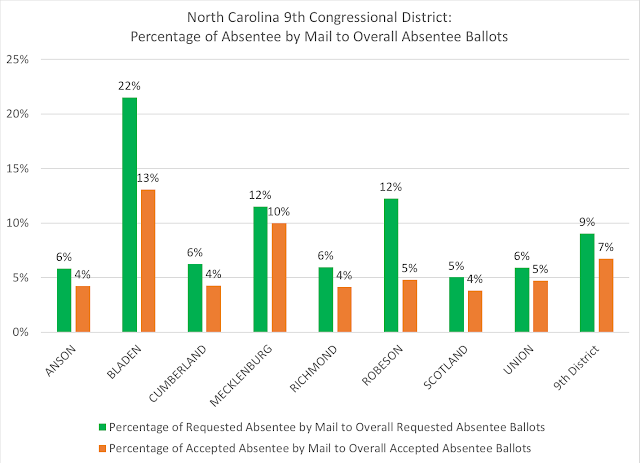 In Bladen County, only 19 percent of the county's accepted absentee by mail ballots came from registered Republicans. 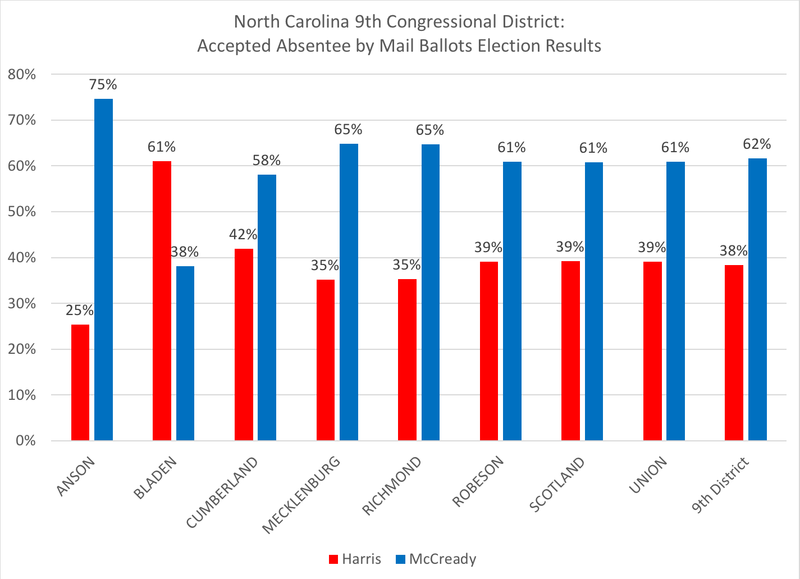 In Bladen County, 61 percent of the accepted absentee by mail ballots went Republican--the only county to do so; meaning that along with the almost 20 percent of loyal registered Republicans who voted that method, Harris would have also received almost all the registered unaffiliated voters and/or some Democratic registered voters to make it to 62 percent of the vote. 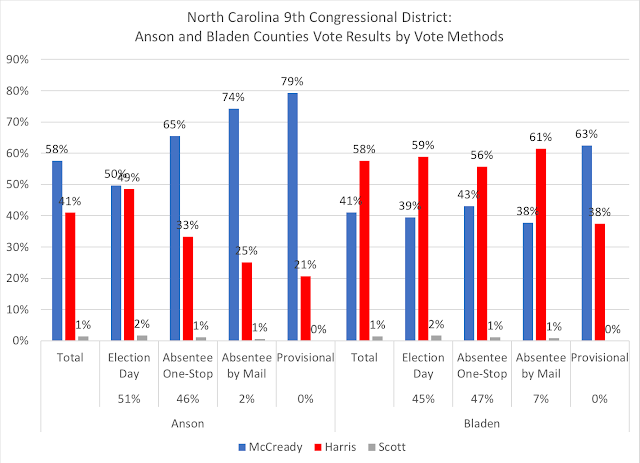 In comparison, in Anson County, Democrat McCready got 75 percent of the absentee by mail ballots, where 80 percent of that vote method came from registered Democrats--again, some likely party defectors in a rural county. 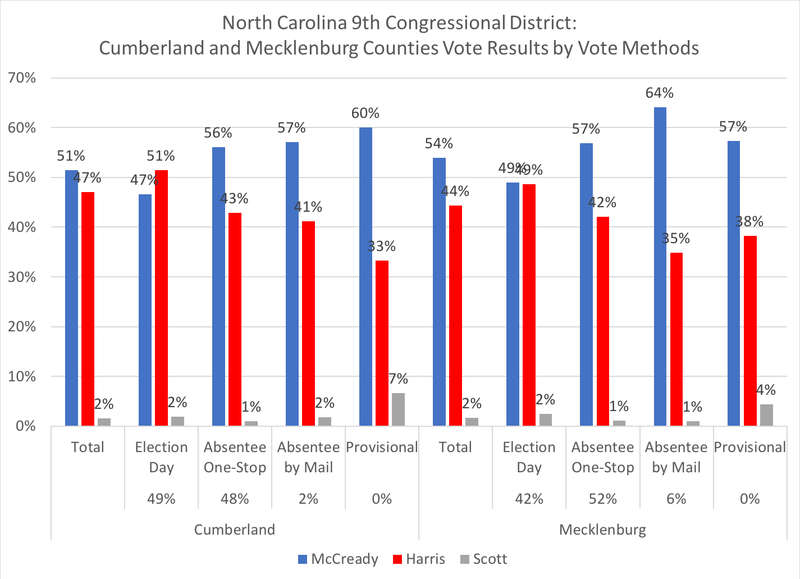 In Cumberland, registered Democrats were 56 percent of the absentee by mail ballots accepted, with McCready winning 58 percent of that county's mail ballots. We will have to wait for the Friday meeting of the State Board of Elections to see what, if anything, an investigation finds regarding the nearly 700 absentee mail-in ballots and the envelopes cast in Bladen County, and what the State Board of Elections may do with the election in the Old North State's 9th Congressional District. For Bladen County, this would not be the first time its voting was called into question. 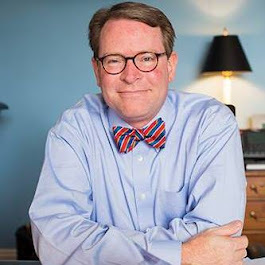 In 2016, several protests were lodged, but ultimately dismissed by the state board, against the county's results with concerns over absentee votes and a community group's "get out the vote" efforts.